Puresight Systems has offered the Amazon Alexa skills in Wi-Fi enabled Roomba 980 vacuuming robot. They have done this as, Indian Household chores are some of the most exhausting, time-consuming, and monotonous activities to get yourself engaged in, and this will further help them to ease up their work at a good pace. Anyone would rather prefer lying on the couch and browsing through smartphone applications and commanding through their voice, instead of sweeping floors with their old school brooms. Bring home iRobot’s offering, the Roomba 980, and you’d strike off one big task from your daily chores, i.e. effortless floor cleaning. The all-new, wireless robotic vacuum cleaner automatically & effortlessly navigates through your home and household furniture, vacuuming even the embedded dust and grime on your floor surfaces without any human intervention. This Wi-Fi-connected IoT device also comes with a specifically-designed, edge-cleaning brush that sweeps dirt and debris from room corners and can be switched on using your smartphone before you start dilly-dallying (even if you’re not at home) with the help of iRobot HomeApp. Bearing a price tag of Rs. 71,900, iRobot Roomba 980 is available for Rs. 69,900 on the iRobot India website and for Rs. 61,466 on Amazon India under current promotional offer for Indian users. Roomba 980 is a stylish, yet sturdy robo-vacuum cleaning device that boasts ultramodern design and visually-stunning aesthetics. The futuristic device has a lean, disc-shaped body with a height of 3.6 inches that enables it to navigate across hard-to-reach spots such as under-bed and below- couch areas. The device, equipped with an array of optical and acoustic sensors as well as the Dirt Detect technology, automatically boosts its performance while working on high-dust regions such as carpets and rugs. These sensors further enable Roomba 980 to concentrate more on areas that require intensive cleaning and prompts the robot to clean them more thoroughly if needed. The robotic vacuum cleaner extends up to 120 minutes of high-powered cleaning and automatically docks to its turbocharging cradle under low battery conditions or when its cleaning job is done. Roomba 980 has also been integrated with iAdapt Navigation Technology that helps it make-up to 60 decisions per second and identifies room contours, furniture, and accessories while cleaning. The robotic vacuum cleaner simultaneously builds a map detecting different rooms and intersections and keeps a tab of its cleaned and unclean areas. As yet another benefit, Roomba 980 can also be voice operated using Amazon’s connected home assistants (Amazon Echo, Amazon Echo Dot, and Amazon Echo Plus) If someone has Amazon Eco at home, s/he can simply speak up – Alexa! Ask Robbie to commence cleaning and Robbie commences cleaning (Robbie could be a custom name of Roomba 980). Even children at home can say this and Robbie can take the instruction and start cleaning floor effortlessly. Roomba 980 is also patched with a very popular web-based service IFTTT (If This, Then That) to create manually written conditional statements such as “Make Roomba clean home after my playlist ends”. Such statements can be written by a user for all services, platforms, and products supported by IFTTT. Roomba 980 can also be voice operated using Amazon’s connected home assistants (Amazon Echo, Amazon Echo Dot, and Amazon Echo Plus) If someone has Amazon Eco at home, s/he can simply speak up – Alexa! Ask Robbie to commence cleaning. Dirt Detect technology: Roomba 980 automatically recognizes and focuses on high-footfall regions where dirt accumulates by leveraging iRobot’s patented Dirt Detect™ Technology. It has also been equipped with an edge-cleaning brush (aligned at an angle of 27-degrees) to seamlessly sweep away debris from edges and room corners. iAdapt Navigation technology and Advanced Sensors: Drawing power from iAdapt Navigation technology, Roomba 980 can easily identify room contours and steer across various rooms. The presence of in-built cliff detection, as well as multiple optical and acoustic sensors, further enables the device to adjust to your home interiors, including raised transitions and carpets, while simultaneously avoiding stairs and other drop-off zones. 10x the Air Power: The device also comes equipped with a 3-stage Cleaning System AeroForce® that utilizes tangle-free, multi-surface brushes to scrape away embedded dirt, debris, and pet hairs from the floor. Its high-efficiency filter has been developed to capture 99% of dust, mites, and allergens (as small as 10 microns). The AeroForce cleaning system also provides a powerlifting suction with up to 10x the air power by automatically increasing the performance of its Gen 3 motor on carpets and rugs, where dust and dirt hide the most. Long-lasting battery and automated docking: Roomba 980 has a long-lasting battery that provides a power-packed vacuum cleaning for up to 120 minutes. It automatically returns and docks at its home base (Turbo Charging Cradle) after completing the cleaning job or when its battery runs low. 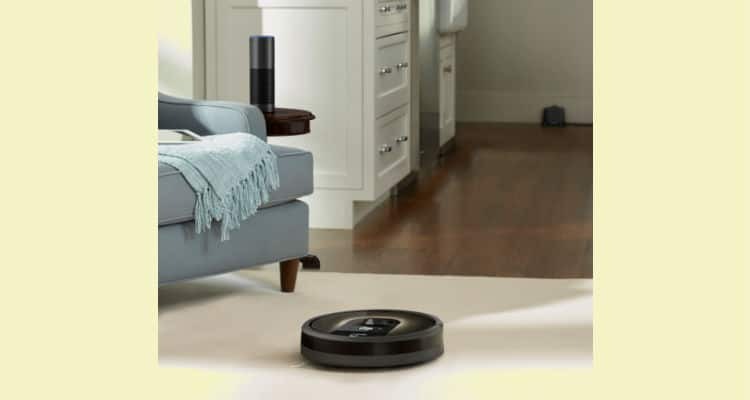 Wi-Fi and App connectivity: The iRobot HOME App, available on both iOS and Android smartphones, enables Roomba 980 customers to have complete control over their home cleaning using the smartphone app. Roomba 980 owners can also preset flexible schedules for up to seven times per week, ensuring that their home remains clean every day, even if they aren’t around. 2 Years Warranty-Card provided by Puresight Systems Pvt Ltd.
Puresight Systems Launches a All New Upgraded Roomba 980 0 out of 5 based on 0 ratings. 0 user reviews.